In December of 2017, a new Commercial Lawn & Ornamental Pest Control Operator exam was launched in Florida. This updated exam covers materials found in two new manuals not previously recommended as study guides: “Identification Guide to Common Florida Lawn and Ornamental Weeds,” and “Lawn and Ornamental Pest Management.”. Photographic pest identification including knowledge of life cycle have nearly tripled when compared to the prior exam. Because this exam is a statewide license, many pests may not be familiar to industry professionals in NW Florida if they are more commonly found in peninsular or South Florida. The new exam also includes Green Industries Best Management Practices (GI-BMP) topics, Florida Statutes, Administrative Rules, safety concepts from “Applying Pesticides Correctly” and label reading – both fertilizer and pesticide calculations and label interpretation. The paper exam has been offered twice in Apopka since the launch last year with pass rates below 50% at both sessions. Panhandle Horticulture Agents in partnership with FDACS (Florida Department of Agriculture and Consumer Services) will be holding a review class May 10-11, 2018, in Panama City. 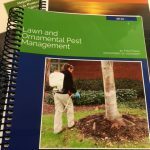 This class is designed to reinforce lawn and ornamental pest control concepts with a focus on newly introduced material for the CPO Commercial Lawn & Ornamental exam, but is not a replacement for independent study. Exams will not be given in conjunction with this class. Anyone interested in taking the CPO Commercial Lawn & Ornamental exam is still required to meet all mandated qualifications of education and/or experience. Applicants must then apply online https://aesecomm.freshfromflorida.com/ with FDACS to obtain a voucher and schedule the test with a local Extension office. This class will also provide CEUs for current license holders in the following categories (please check 2018 CEU Commercial L&O Flyer for dates – not all CEUs available both days): Commercial L&O, Limited L&O, LCLM, O&T, Private Ag, Limited Urban Fertilizer. Core CEUs will be available both days. Registration is customized based on attendees needs as one-day of your choice or two-day. If you plan to take the Comm. L&O Exam, it is strongly encouraged that you attend both days.